Popular history has George Hendee witnessing Oscar Hedstrom’s tandem pacer in action during the December 1900 races at Madison Square Garden, where he was so impressed that he offered Hedstrom a partnership. Another version dates their meeting a year earlier, and suggests Hendee booked the motor tandem team of Henshaw and Hedstrom to pace races at the Springfield Colosseum for the 1901 season. 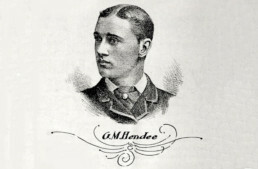 In Middletown, Connecticut, 42 miles from Springfield, Massachusetts, Oscar Hedstrom had, by 1895, established a reputation as a builder of custom racing bicycles. He worked at the Worcester Cycle Manufacturing Co, where he created the Birdie Special. 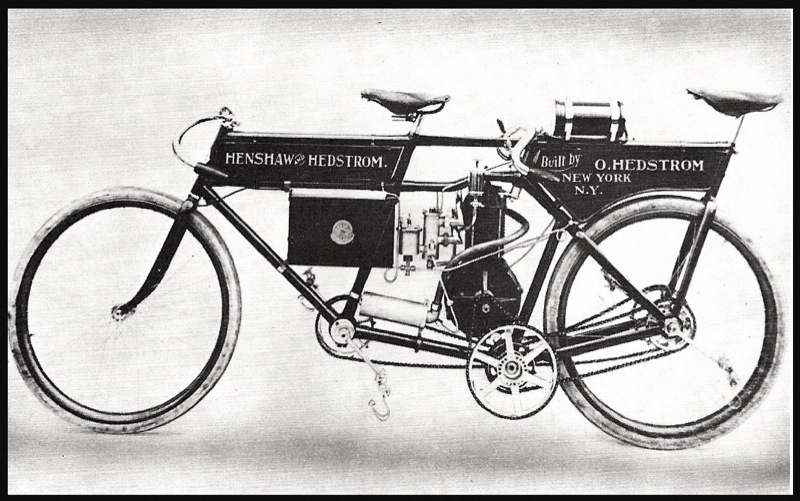 In October 1895, Hedstrom changed his club affiliation to team up with another Worcester employee, Charles Henshaw, to create a professional tandem pacer team, and they quickly became known as one of the fastest tandem teams on the racing circuit. The pacer cycle built by Oscar Hedstrom in 1900 with his business partner Charles Henshaw, using a modified DeDion engine in a custom cycle chassis. Note the rear rider’s position aft of the rear axle, as close as possible to a following cyclist to provide a draft. 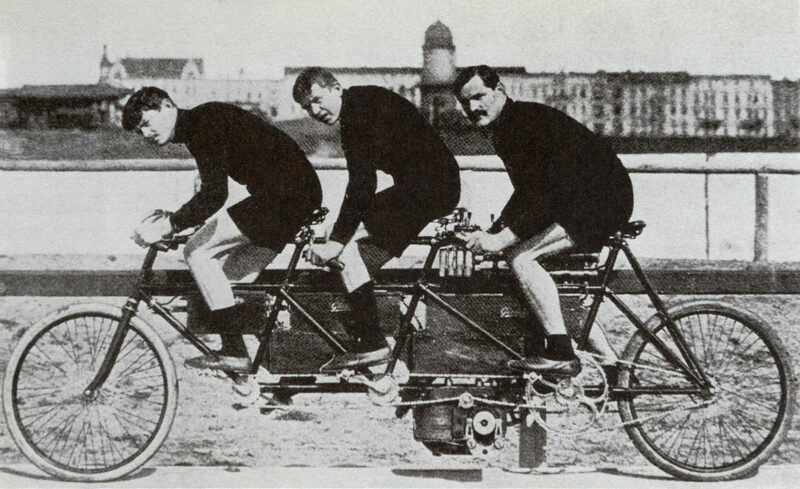 Pacers were teams of men—usually two, but sometimes three or more—on multi-seat bicycles (tandems, triples, or quads) that would provide a high-speed pace for a racing bicyclist, and create a slipstream to reduce wind resistance. This allowed professional racers to increase their speed and endurance, recording higher top speeds for longer distances. Professional medium- and long-distance stars demanded unlimited pacer teams, and would often use 10 or 12 teams per race. In France, Comte DeDion had designed a small internal combustion engine in 1896 and placed it in a tricycle, called the DeDion-Bouton. The following year they were producing and selling both the motor tricycles and individual engines, and they were popular, selling in the thousands (a racing series was even created for trikes). 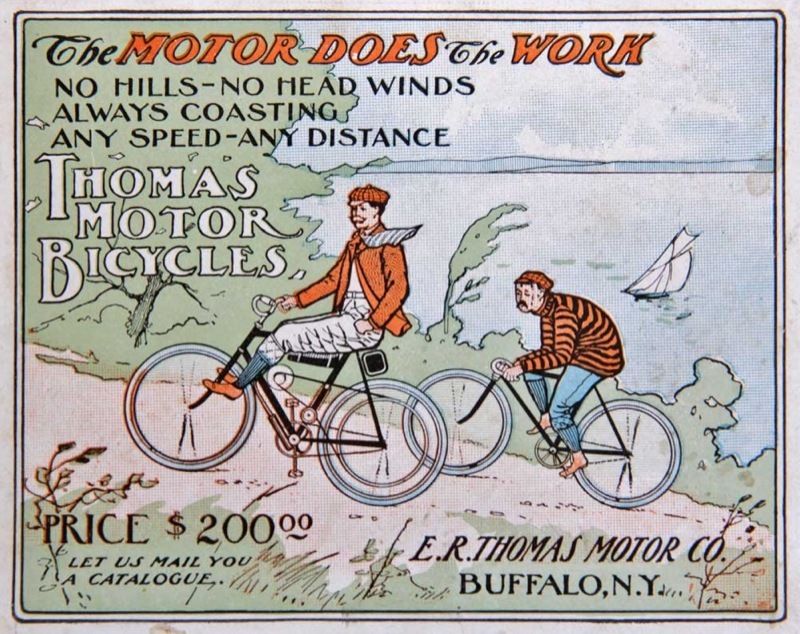 Kenneth Skinner of Boston acquired the sole U.S. distribution rights for the DeDion-Bouton in November 1897, and partnered with Charles Henshaw to open the Back Bay Cycle Company. Allegedly, Oscar Hedstrom learned to tune the engines of imported De Dion-Bouton tricycles and quadricycles the following year. In the fall of 1898, French racing champions Henri Fournier and Gaston Ricard toured the U.S, and brought with them three motorized pacers: a single, a tandem and a tricycle. The first official bicycle race in the U.S. using a motorized pacer took place at the Waltham, Massachusetts, racetrack in November 1898. The second race was held at Madison Square Garden on December 3, where Fournier, on the motorized single-seater, paced Eddie McDuffee, and also demonstrated his pacer with other racing stars. Between races he rode the tandem motor pacer before a crowd of 10,000 spectators. 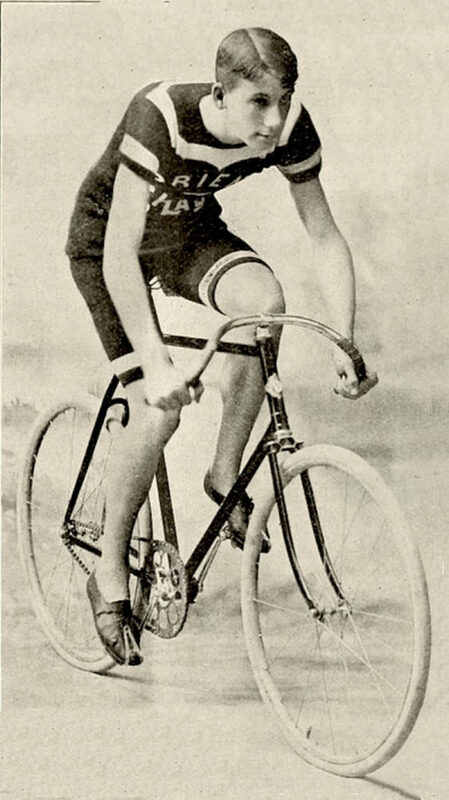 On December 26th 1898, a 20-mile race was held at Madison Square Garden: Fournier on his solo mechanical pacer led Jay Eaton and Teddy Goodman, while Harry Elkes was paced by a series of seven man-powered tandem teams working in sequence. The event was billed as man against machine, a popular subject in the age of John Henry, and the dawn of motorized transport. Unfortunately, the drive belt on Fournier’s machine parted during the third mile and took him out of the race. Oscar Hedstrom was present that day, and competed in the professional half-mile race (placing 1st) and the one-mile handicap (placing 2nd): it’s hard to imagine that he missed seeing Fournier’s pacer perform. The Eddie Macduffee pacer as seen at the Springfield Colloseum in 1900. It’s an enormous machine! 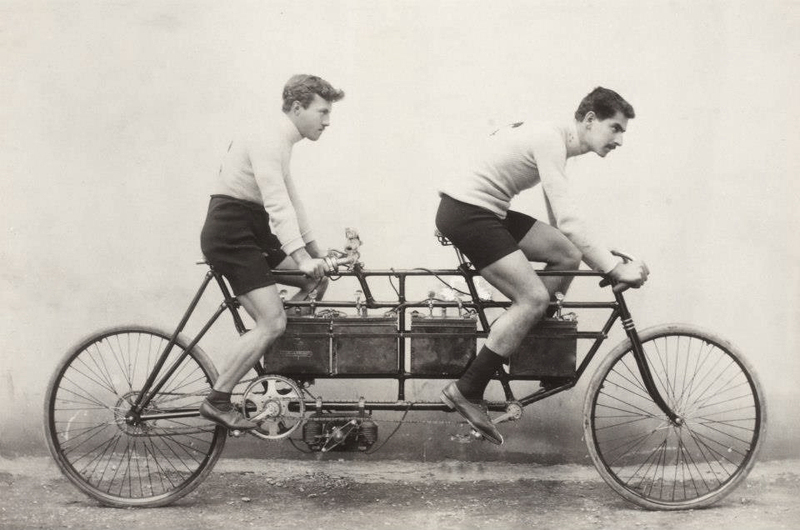 In March of 1899, Fournier built a motor tandem configured as a “bob tail.” This chassis design had been invented by Hedstrom the previous year, with the rear seat placed behind the axle to provide the racing bicyclist with a better slipstream; it would soon become an extremely popular pacer style. In May, Fournier began to import tandem motor pacers from France and first used them at Ambrose Park in Brooklyn. Demand was high, and that month the Fournier-Henshaw team also appeared at the Woodside track in Philadelphia and the Baltimore Colosseum. Although Charles Henshaw was involved with Fournier’s import business and pace team, he also organized his own professional motor-pacer teams and promoted races at Crystal Lake Park in Middletown, Connecticut. The Waltham Manufacturing Co. was producing the popular Orient bicycle, and developed an Orient motor pacer using an Aster engine. It was finished in time for a race meet on May 30, 1899, and early in June, Henshaw was riding it at the Waltham and Charles River tracks. On June 17 at the Waltham racetrack, Fournier and Henshaw riding a French pacer were beaten by the Orient machine. The same happened at the Manhattan Beach track on July 4, except this time Henshaw and Fred Kent partnered on the Orient. By the fall of 1899, the Orient pacers (not retail motor bicycles) were being advertised for sale, with 25 sold by the end of the year: almost no champion bicyclist was willing to compete without a motor cycle pacing him. An Orient pacer tandem of 1901, using an Aster motor: one of Indian’s rivals in the pioneer American motorcycle industry. While production motorcycles were available from 1894 (the Hildebrand&Wolfmuller), the sport of pacer-racing did more to promote motorcycles and their development than any other avenue at the turn of the Century. The evolution of and demand for motorized pacers was explosive. Promoters wanted them because they were less expensive than paying multiple teams of human pacers, and their novelty drew crowds [often these were the first motorized vehicles of any kind spectators had seen, and were certainly the first moto-cycles – ed.]. Racers wanted them because they attained faster times and thereby were able to establish new track records. In an October article in The Wheel & Cycling Review it was revealed that Frank Waller made $1,000 clear in one month while operating a motor pacer, and another champion racer made enough money to purchase a second pacer after only a month of operating his first. In one month during 1899, Fournier and Henshaw had 16 pacing engagements, and traveled over 10,000 miles to fulfill them. There was money to be made. During this period, both Oscar Hedstrom and Charles Henshaw were also racing as professional bicyclists and, as a muscle-powered tandem team, held the national records for the unpaced half-mile and mile, and the mile and two-mile records for paced. As part of a quint (five-man tandem) team Hedstrom placed third at Ambrose Park in May, while Henshaw, paired with Kent, came in fourth. 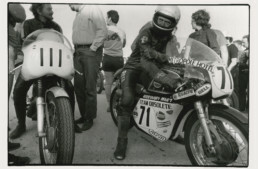 Unfortunately, on June 19th at Manhattan Beach in the fourth lap of the Great Atlantic Sweepstakes, Hedstom got tangled up in a spill with two other riders and dislocated his shoulder, which put him out of competition for the remainder of the season. Like many other racing stars, Harry Elkes appeared in ads representing sponsors. He would die in a horrific accident in 1903 when a pacer rode over him. It’s remarkable how little bicycles developed, or needed to develop, for the next 100 years. On September 18 1899, Hedstrom teamed up with pattern designer William Russell Frisbie, who did contract work for Worcester Cycle Mfg., Waltham Mfg., and Keating Wheel Co: their aim was to create a motorized pacer. Hedstrom built a tandem frame and modified—or, at the very least, converted from metric to SAE—a DeDion engine in the shop that he had been renting from Worcester Cycle since February 1898. This tandem motor pacer, nicknamed the Royal Blue Express because of its paint and nickel fixtures, was built under contract for racing star Charles Miller. Weighing only 130lbs, it was tested on November 24, 1899, in Middletown, and three days later at the Berkley Oval in New York. It would be used in the main event at Madison Square Garden on December 16 to successfully pace Harry Elkes in the one-hour race. 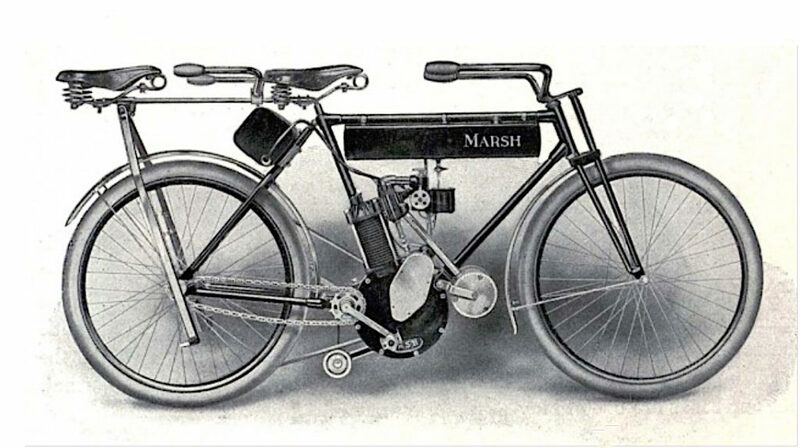 The first Marsh Motor Bicycle was built in 1899, with a small DeDion motor attached to a bicycle., built by W.T. and A.R. Marsh in Brockton, MA. By 1901, the Marsh brothers were building their own motor based on the DeDion template, with 510cc capacity and an inlet-over-exhaust motor, with ‘atmospheric’ inlet valves. This pacer is likely from 1902: the Marsh brothers teamed up with Harry Metz (Orient) in 1905 to make Marsh-Metz (M-M) motorcycles from 1905-14. The partnership between Hedstrom and Frisbee was dissolved in January 1900 because Frisbie wanted to develop marine engines and automobiles. Hedstrom continued working on his own motorized pacers fitted with his modified DeDion “Typhoon” engines (tandem #2 was built in May with a 3.25 hp engine and #3 had a 5 hp), and producing his Hedstrom Special racing bicycles. Several of the motor tandems were sold to racers in the spring, but despite numerous requests he stopped producing them during the race season due to racing team commitments. In March 1900, Kenneth Skinner retained the services of both Henshaw and Hedstrom as racing experts to represent his interests on the track, but it wasn’t an exclusive contract. The team of Henshaw and Hedstrom owned two Typhoon tandems and ran them with Everitt Ryand and Harry E. Caldwell—both champions—as steersmen during the 1900 race season, and there was the team of Fournier and Henshaw with its own hectic schedule. Although Hedstrom and Henshaw did pace in the Springfield event on July 31, the press mentioned one or the other men at numerous events from Philadelphia to Boston during the 1900 race season. The 15-mile motor tandem race that was held on December 28 at Madison Square Garden has provided a basis for one version of the Hendee-meets-Hedstrom myth, but whether or not either man attended that event remains unknown. However, that month it was announced that Charles Henshaw would be going on the road as the New England representative for the E.R. Thomas Motor Company. This, plus the Worcester Cycle Co. bankruptcy, may have had an impact on Hedstrom’s decision to seek another venture. 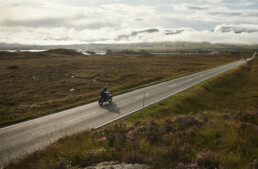 Read Part 3: ‘The Indian Motocycle is Born’ here. Special thanks to Thunder Press for allowing TheVintagent.com to reprint this important research. amazing! 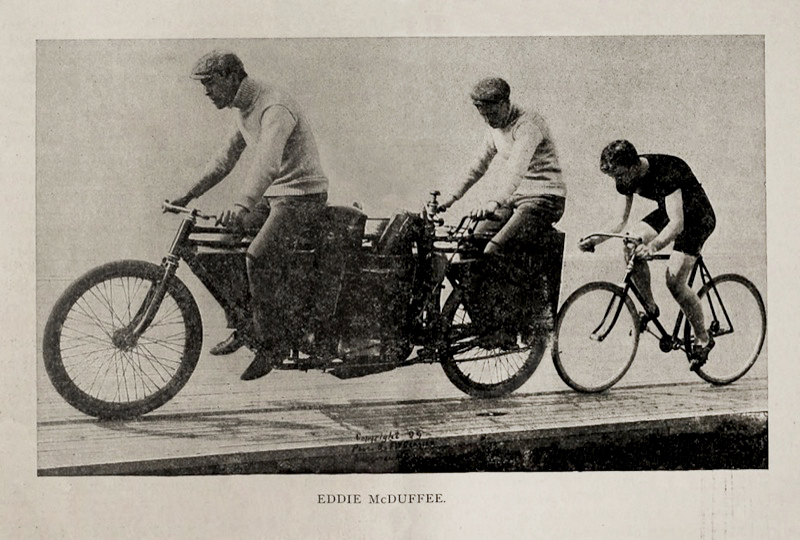 one of the earliest uses of the motorized cycle was to facilitate bicycle racing? OK-did anyone ever think of racing pacers? Absolutely! That’s how motor cyce racing got started. One of the most successful of these proto-racers was a pacer steersman named Jacob De Rosier. As a resident of eastern Mass and an avid motorcyclist for 40yrs I had no idea how much the area contributed to early motorcycle development .Sure Springfield has Indian but Brockton , Waltham , Worcester all very enlightening .